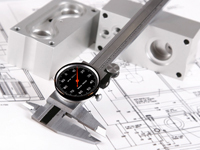 In addition to our stringent in-process controls, all components must pass a thorough final inspection. All testing is conducted in a 68 degree Fahrenheit climate-controlled inspection room using equipment calibrated to NIST (National Institute of Standards and Technology) standards. All components and sub-assemblies are 100% inspected, identified with our logo if required and a final inspection is generated pertaining to all the critical dimensions. We also perform first part inspections for every subsequent operation performed. To learn more about our parts inspections and techniques or to inquire about other inspection services, please contact us. (1) BROWN AND SHARPE MICRO-HITE 900 HEIGHT GAGE, 36" TRAVEL, ACCURACY .0001"